人算不如天算. 昨日綺夢今朝散. 總想話一早流流就能飛車到海灘, 準備去享受一下温和而無優無慮的清閑. 因此借病為題與公司 請一日假, 打算完成昨日一塲狂想. 誰知一層寒冷的海霧, 竟然把全個南加洲濃罩起來! 蔭天淒淒, 微雨霏霏, 刺骨入心. 奈何奈何. Best laid plans always go awry. Yesterday’s dream, today’s tatters! All I wanted was to sped to the beach this morning and prepare myself a day of warmth and relaxation with no care or worry. Hence, I call in sick to let the office know that I will be taking a day off; hoping to realize my yesterday’s grand illusion. Who knew that a cold layer of marine fog would unexpectedly blanket the entire Southern California with tiny drizzles and cloudy cold piercing to my inner core? Alas, alas. @Melaminefree: Thanks for your compliment. I am sure there are mistakes! I am still learning Cantonese from a formal point of view. Still don't understand all those current slang from Hong Kong. Though I did learn 2 new ones (公主病 and 事業線) from Carlos Dough. He puts us Chinese to shame. Yes, I was playing with the words, 一筆勾消. 我是形容雲霧為一塊布.用個勾來取去. Same for playing with the phrase 鶼鰈情深 for 鶼鰈陽光 :) @Phoebe: Thanks. Now I learn a new term! Wheeeeeeeeeeeeeeeeee! Actually, I couldn't think of anything appropriate for the translation from English. If I were to translate it as "catch the adulterors" the mood of the situation is very different. However, in their respective language context, both are perfect situations. 捉姦 can be very hilarious in Cantonese comedies. The correction that other peoples made are not Cantonese, but Mandarin. I use Cantonese to correct your article now =). 鰜鰈陽光 is grammatically correct. I just worry that some people may not know what you mean as that word is rarely used in the daily life. In conclusion, your article is a good one as it have no large mistake. Most people that know Cantonese will get what you mean =) I gave a "good" for your article. @Sunny: I was wondering when you will be coming onboard. 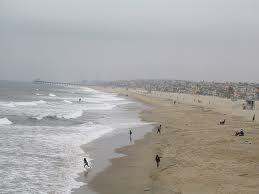 :) I usually go to Redondo Beach because parking is better. From the last time you went to Long Beach bar, I thought it may took you 2 hour for you to Longbeach ?It seems Jeff always play outside at weekend. I wondering where did you go last weekend. You have said "下文"before. I think the esaay I read yesterday was the "下文". This morning, I thought Jeff didn't say where he went in his "下文＂,Why? Is there something I missed? last Thursday he was so happy, it implied that he want to go out to enjoy spring....So, I try my best to find you Hermosa...Sorry I am so late for your essay, but I feel really happy when I saw the picture of the beach that I had ever walked. Wonderful memories are lingering in my mind....Thanks!Thanks ever such a lot!